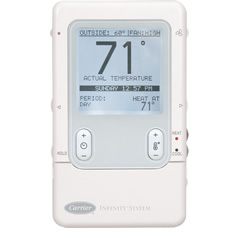 With our wide variety of highly engineered thermostats including our all-star Infinity® Control, you have precise control over temperature, humidity, air treatment and scheduling. It’s the advanced heating and cooling innovation you’re used to from the experts at Carrier. The revolutionary Infinity Control taps the power of the Infinity System. You’ll find unmatched access to every type of environmental control. Remote programming can be added as an accessory. Simply our best thermostat. 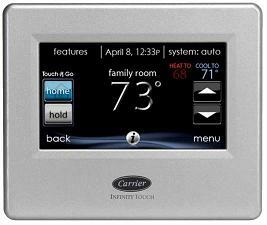 Carrier’s revolutionary Infinity Touch Control is the smart control of the future. 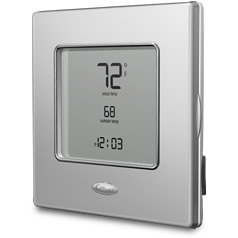 The Infinity Touch Control features a high resolution display, making it easier to read. Intuitive prompts let you program everything from humidity levels to fan speeds, giving you the ultimate control over your home comfort.